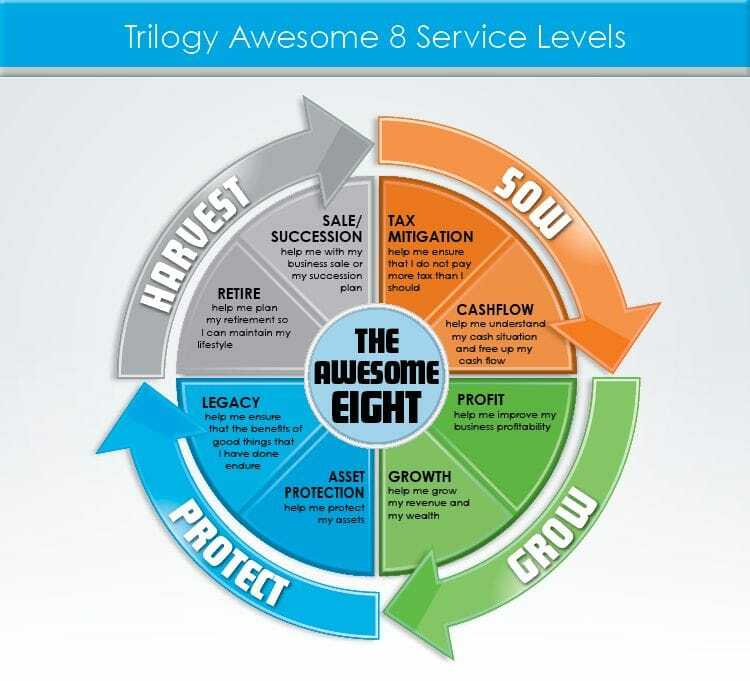 The "Awesome 8" wheel shows all the different financial areas we look at with our clients. setting you up to ensure you have the right structures in place for your business and investments to minimise tax, business planning, goal setting, implementing the most efficient systems and ensuring adequate cashflow and working capital. this is a very important area because after all your hard work we need to make sure nothing will jeopardise the assets and investments you have created. We also look into what you would like your legacy and that it endures into the future no matter what may come along. planning for the day your retire or sell your business and/or investments. This is not an area that waits until you are near retirement age to look at. You should be planning your sale of your business from the day you start it and the earlier you start planning for retirement, the better. As all our clients are in different stages in their business and investment world, not every client will need to use our services in that order and not every client will need all of those services. This is the reason we have developed 4 service levels to accommodate the different requirements of our clients.